Anyone who has lived in the Valley for a significant amount of time knows Streets of New York. Opened in 1976, the New York style pizza joint has become a staple with 26 locations including 2 in Las Vegas and Prescott. They are even the official pizza of the Arizona Diamondbacks, Phoenix Suns, Phoenix Mercury, Arizona State Sun Devil Stadium, Arizona Rattlers and the Spring Training facilities at Salt River Fields! Streets of New York recently added new items to their already expansive menu. New pizzas, pastas, and appetizers have been added. We recently were invited to come in and try a few of them out. Let’s just say the New York Combo (our typical go-to pizza) has some stiff competition (and it isn’t another pizza either)! For those of you who regularly dine in at Streets of New York, you’re are probably very well aware of their delicious passion bread. Well get ready, because it is about to get even better! One of the new menu items, is the Four Peaks Beer Cheese. 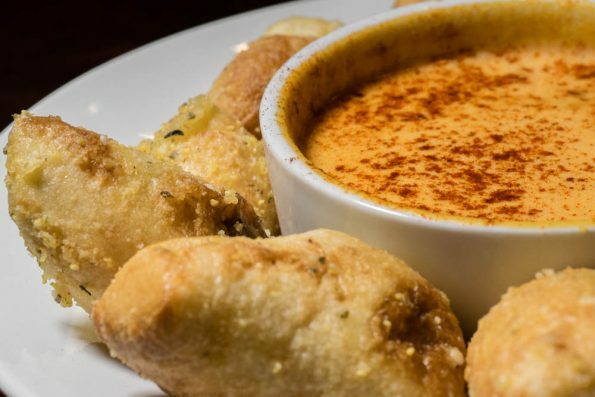 The beer cheese is made with Four Peaks Kilt Lifter, cheddar, swiss, garlic, Texas Pete’s Hot Sauce, pepper, paprika. It is served with a bottomless basket of passion bread. We told you it got better! This cheese has just the right amount of heat to get the party started without being too overbearing. If you are a cheese fan, this appetizer is for you! Next we dug into our pizza. Streets of New York has 6 new pizzas on the menu. This includes a Buffalo Chicken Pizza, a White Pizza, and even a Neopolitan Pizza. However, because we are total carnivores, we opted for the Divine Swine (we may have just loved the name). 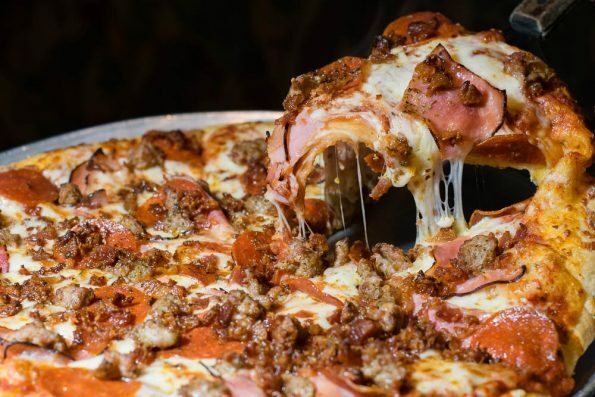 This pork lovers delight features pepperoni, sausage, black forest ham, bacon. Much like the New York Combo, or any Streets of New York Pizza for that matter, there is no lacking for toppings. This pizza comes fully loaded! We would have loved this pizza more (it really was a great pizza) if we hadn’t been served our next entree. When it comes to pasta at Streets of New York, its typically been the basics. You know, spaghetti, baked ziti, lasagna, alfredo. Streets of New York has put 2 new pasta entrees on the menu and let us tell you, they have upped their pasta game. We tried The Toscana and were absolutely blown away! The Toscana is made up of garlic chicken, artichoke hearts, spinach, onions, roasted garlic, pecorino, and pesto cream sauce. 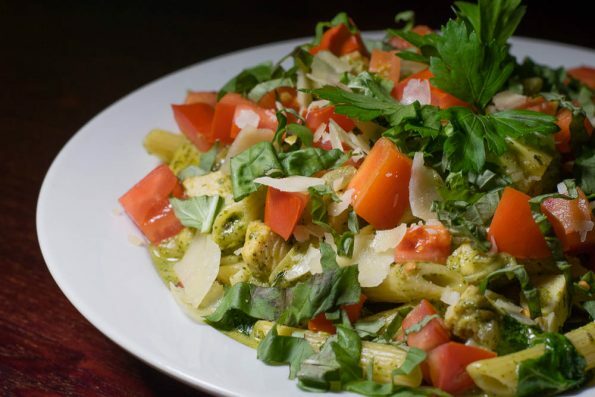 It comes with your choice of pasta (we tried it with penne) and is topped with fresh tomatoes and a mountain of fresh basil. When it was served, the first thing you noticed was the scent of fresh basil. After the first bite we were sold! We completely forgot about the delicious pizza sitting in front of us and focused on the pasta at hand. This pasta was a game changer for us. We never would have thought to suggest Streets of New York for pasta, but now we will! Streets of New York has been a huge part of the Valley for the past 40 years. We want to take this time to say congratulations of 40 years and we can’t wait to taste what the future holds at Streets of New York! What is your go-to pizza at Streets of New York? Do you have a pizza you miss (*cough*garlicshrimppizza*cough*)? We want to hear all about it! Leave a comment below or use the hash tag #GeekEats!